I almost forgot, but my 4th book has been published ! 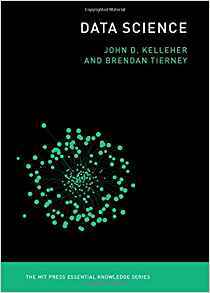 It is titled 'Data Science' and is published by MIT Press as part of their Essentials Knowledge series, and is co-written with John Kelleher. It is available on Amazon in print and Kindle formats. Go check it out. This book gives a concise introduction to the emerging field of data science, explaining its evolution, relation to machine learning, current uses, data infrastructure issues and ethical challenge the goal of data science is to improve decision making through the analysis of data. Today data science determines the ads we see online, the books and movies that are recommended to us online, which emails are filtered into our spam folders, even how much we pay for health insurance.